The tea trees appeared in Lamdong for a long time, earlier in 1920s. In 1927, they established Cau Dat tea Factory with a lot of the French-owned tea plantations around the factory. After that they grew it in B’Lao (the present Bao Loc - Bao Lam ) and from that time tea became the major products of the Agriculture sector in the locality around 60 years ago. Lamdong is the locality holding a lot of records of the tea sector in Vietnam such as the locality which has the first tea factory (Cau Dat tea factory), the biggest tea area in the country, the region with the oldest factory still in operation, the region with the biggest tea shop in the country, the busiest tea town (Bao Loc). Lamdong is also the first locality in Vietnam to organize the Tea Culture Festival (every two years) to advertise the brand names of tea producing enterprises and their products in Lamdong, affirming the strengths and potentials of Lamdong tea, meeting with other tea brand names across the country, honoring the specific value of tea gastronomy, stimulating the tea consumption in the domestic markets and for the export as well. Besides the traditional green tea, Lamdong also produces the flavoring-scented tea for the demands of the common people, and the black tea for the export to Middle East, EU, the USA, Indonesia, Singapore,... 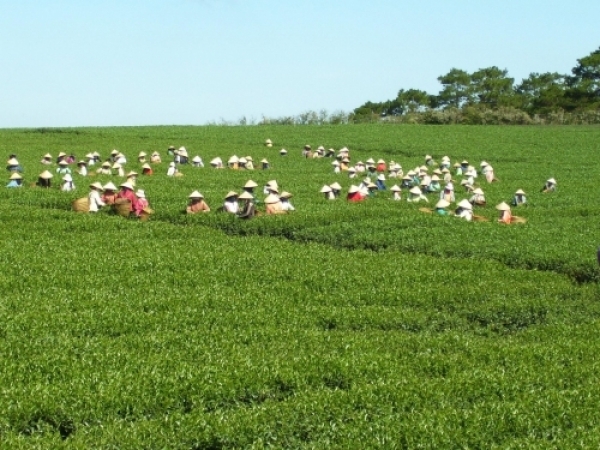 In recent ten years, the province has imported kinds of the superior teas such as Oolong, Kim Tuyen, Tu Quy, Thuy Ngoc,… from Taiwan, China and Japan and this has brought a new appearance and a new economical growth for the tea producing-trading sector of Lamdong.